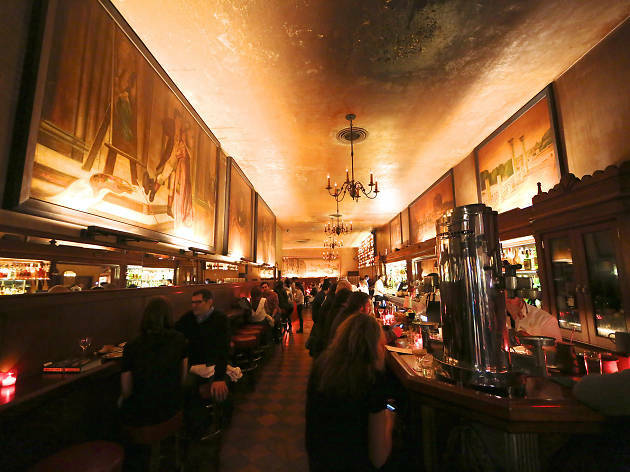 Open since 1919, this legendary North Beach bar and restaurant has drawn a shifting cast of celebrities from Hunter S. Thompson and Francis Ford Coppola to Johnny Depp and Sean Penn. In 2013, renowned Anglo-American restaurant duo April Bloomfield and Ken Friedman took the spot over and started serving modern Italian fare that reflects chef Bloomfield's trademark passion for offal. 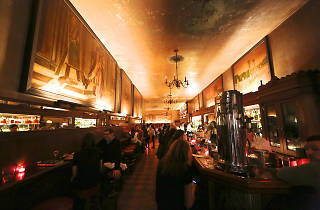 Yet Tosca has maintained much of its original charm with an impressive front bar and a jukebox blaring eclectic tunes. Rising mixology star Isaac Shumway, previously of Bourbon and Branch and Heaven's Dog, is behind the perfectly executed classic cocktails (and riffs thereon). Of special note is the bright and refreshing Polo Cup (served with a choice of gin or vodka and a wide ribbon of cucumber), the rich and boozy Scotch-based Old Grampian, and the deep and complex Trouble in Paradise (a jammy, frothy drink with spicy notes made from bourbon, Campari, basil, lemon juice, grapefruit juice and black pepper tincture). Order a House Cappuccino, and you'll get a hot, Armagnac-and-bourbon-spiked after-dinner drink frothed in the antique espresso machine. For the indecisive or adventurous, ask for the “Dealer's Choice”: The bartender will quiz you on your tastes and mix you a custom quaff.